The statue pays tribute to the Nobel-Prize winning poet who was sent into permanent exile, only to become America’s darling and U.S. poet laureate. In a courtyard off a boulevard that hums with traffic is a giant new statue of a poet who never asked to leave and never returned when he had the chance. The vast figure of Nobel-Prize winning laureate Joseph Brodsky stands on a granite base looking up to the sky just off Novinsky Boulevard, yet his eyes appear to be closed. 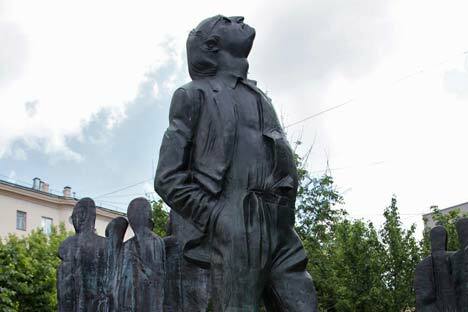 Nearby are sculpted silhouettes of twelve people in two groups, but Brodsky seems unaware, lost in his thoughts, clothes somewhat crumpled, hands in his pocket. At one point in the trial, the judge told Brodsky to “forget the big words” after he tried to explain that there was such a thing as “spiritual” rather than “physical” labor. In 1972, he was expelled from the Soviet Union, settling in the United States, where he became poet laureate. He died of a heart attack in 1996. He never saw his parents again after his exile, and he did not return to Russia, even as it transformed into a different country from the one that had rejected him. Cut off from his beloved home city of St. Petersburg, Brodsky lived in Ann Arbor, Mich., had a flat in New York, is buried in Venice and now has a grandiose monument in Moscow. “It is a repentance to those who were ejected from the country during that time,” said sculptor Georgy Frangulyan, who toiled for the last seven years to get his sculpture unveiled. Talking about the form of the sculpture, Frangulyan said it shows how a poet is alone but with a circle of followers. “Some people go through life like a shadow and some become individuals,” he said. The statue was not paid for by the state or by the city, but by Frangulyan, whose statue of bard Bulat Okudzhava stands close by on the Old Arbat Street. As a link to Brodsky’s hometown, the granite used in the base of the sculpture is the same as that used in the embankments in St. Petersburg. The statue, located just across from the United States embassy, was unveiled at the end of May. Getting there was not a simple journey. Moscow has close to a thousand monuments, celebrating many, from Nehru Gandhi to Sherlock Holmes. Many were commissioned under the previous mayor Yuri Luzhkov, whose love for monster-sized statues and his court sculptor Zurab Tseretell were the subject of bitter complaint. Tsereteli had actually planned a monument to Brodsky under Luzhkov, but the idea was shelved following an Internet uproar against the idea. Frangulyan created the design for a competition to put a statue up in St. Petersburg. He didn’t win. Frangulyan liked his own design so much he went ahead with it anyway and four years ago, the city, under Luzhkov, agreed to take it. It was the city’s idea that it should face the embassy. Brodsky actually left for Vienna, initially, but he did become an American citizen and poet laureate in 1991. Reaction to the statue has been mixed with positive comments in the media, but grumbling by locals, still allergic to the gigantism of the Luzhkov era. Others asked why it was in Moscow. “There was some questions [about that] but [French writer Honore de] Balzac was not born in Paris and there is a statue of him there,” said Frangulyan. Frangulyan wouldn’t say exactly how much it cost, but said it was a few million dollars. It is not the first time that somebody has brought Brodsky back to his homeland. Alexander Krzhanovsky’s much acclaimed 2009 film “One and a Half Rooms” imagines the poet returning to St. Petersburg in a nostalgia-filled drama. There is talk again now of a statue in St. Petersburg, but Frangulyan feels that paying tribute in Moscow is important.